Commander Shepard and Agent Coulson had a crossover. But, it's not the good kind. See, some concept drawing for BioWare's popular sci-fi video game saga apparently got swiped in a recent episode of the Marvel Entertainment television series. And some eagle-eyed Mass Effect fans spotted it. 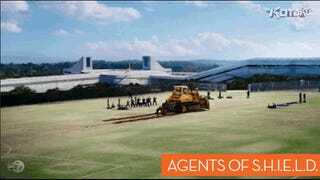 As reported by Eurogamer, an exterior shot from the Dec. 10 episode of Agents of SHIELD features an exterior shot that seems to lift structures from a piece of Mass Effect art titled "Earth Alliance." A user named "fhweufhewiu" on BioWare's Mass Effect forums noticed the similarity and posted a comparison shot. As you can see, despite some major alterations to the alleged source image, the two images look very much alike. The rub here is that BioWare itself came under fire for using external images as the basis of artwork that appeared in Mass Effect 3. An image of Quarian castmember Tali without her mask on and the backdrop for the game's ending sequences both appeared to be sourced from art produced elsewhere. Kotaku has reached out to BioWare and Marvel for comment and will update this story if they respond.